Great dishes are as much about textures as they are about flavor. I will eat something flavored with mushrooms, but give me the mushrooms themselves and I will pass them by. I don’t like their texture. Combining great flavor and complimenting textures is the key to making great food. This is why the dish “bangers & mash” works so well. 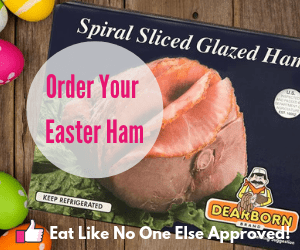 The meaty texture of the sausage, combined with the soft, creamy potatoes, and add in some lighly cooked greens you got something to really sink your teeth into. 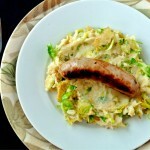 With St. Patrick’s Day approaching and finding Irish Style Bangers at Trader Joe’s, I decided to give this dish a try. I was so glad that I did! 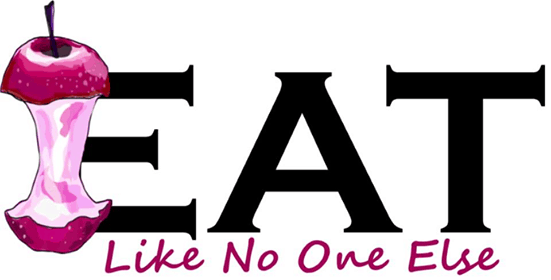 I first heard of Bangers & Mash while watching Robert Irvine on Food Network. He has brought the dish out in several shows he has been on. He is British and this is a classic British dish – that I am putting an Irish spin on. 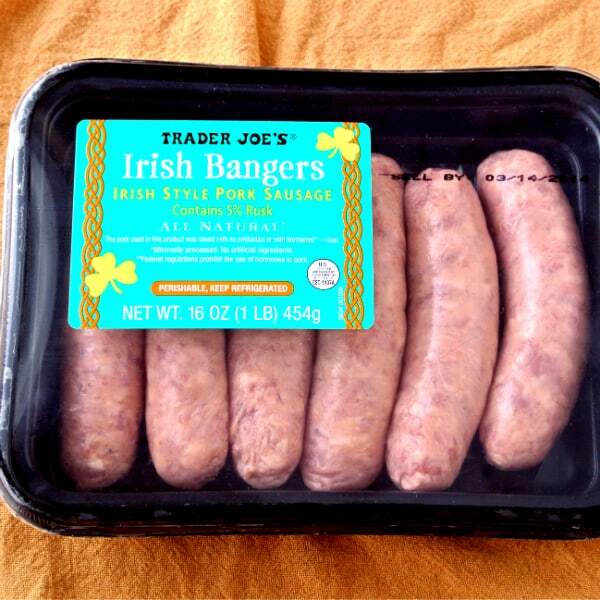 I start by using the Irish Style Bangers from Trader’s. They contain 5% rusk. Rusk is a hard, dry biscuit, that is baked twice. Similar to what we would give to a young kid as a teething biscuit. The rusk is ground into crumbs and added to the sausage. The sausage is not heavily spiced, but has a good flavor, and plumbs up nicely when cooked. For cooking the sausage, I start by cooking them in a little bit of water. Then I brown them on each side when the water is gone. This helps to keep them from burning on the outside before the inside is cooked. I like doing the water first, so the outside of the sausage will be crisp in the end. I want something to bite into. If you haven’t figured it out yet, the Mash, is mashed potatoes. To make this “more Irish” can’t just serve mashers on their own, need to add a little green. 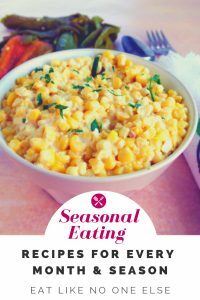 Colcannon is mashed potatoes that have cabbage mixed in, Kale is used as well (related post – How to Make Irish Colcannon). Cabbage is great and all, but I prefer the flavor and texture of it’s cousin, the Brussels Sprout. I ran the Brussels Sprouts through my food processor (just like in my Brussels sprouts with bacon recipe). Then pan fried them up, in a little bacon fat for more flavor. Shredded Brussels sprouts hold up a lot better than cabbage in the potatoes. I was glad I only had Brussels sprouts on hand when I made the potatoes. 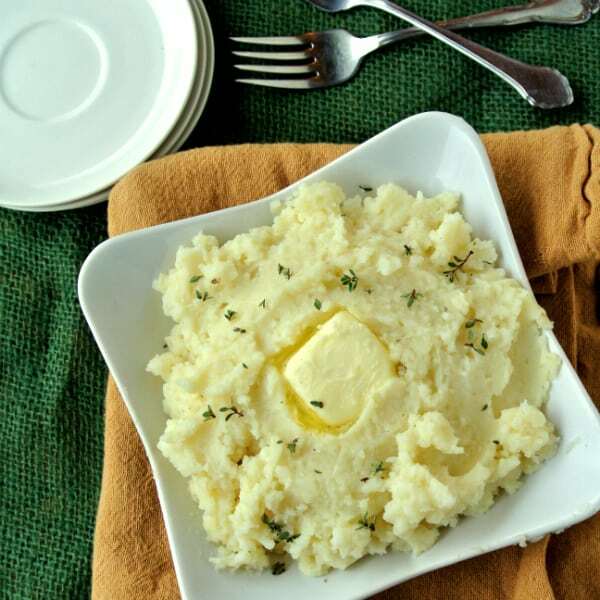 You can make the actual potatoes anyway you like, for a easy and flavorful method try my No Peeling Necessary Mashed Potatoes. They are baked potatoes that get the mashed potato treatment in the end. My wife, my oldest daughter, and me devoured the dish with big smiles on our faces. This was the first time I got my daugther to eat Brussels sprouts! SCORE! Hiding vegetables in mashed potatoes is a great way to introduce your kids to new veggies. They can get use to it, then later you can try to introduce them on their own. Shred the Brussels sprouts in a food processor or with a knife. Heat up a frying oan over medium high heat. Add oil or bacon fat. Add in the sprouts. Cook the sprouts for a couple mintues to just soften and brown. Remove from heat. Add the sausages to a pan with water covering them about half way up. Bring to a boil. Once the water runs out, brown the sausage on each side. Total cook time should be around 10 to 12 minutes. The sausage will plumb as they cook. Serve the sausage right on top of the mashed potatoes.